Listening to Godflesh is more of a all-encompassing emotional experience than say, a casual affair. Something about the truly menacing riffs, mechanistic rhythms, and Broadrick's slithering voice create the perfect companionship for darkness in the city. Maybe I feel this way because I used to spin Streetcleaner quite a bit when I was in my angst period ('89, Philadelphia), but it just seems to fit. The Godflesh attack isn't as threatening as it once was, but with each album brings new advancements to the trademark sound, as close to the idea of "Industrial" as you'll hear from a major label these days. The last platter I really dug by these guys was Songs..., partially because Brain was on drums (in place of Machine), and if Earache hadn't sent this to me, I doubt I would have picked it up. Why? 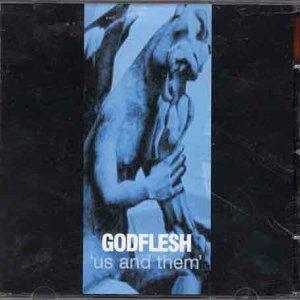 Well, I don't listen to this brand of pain as much anymore, but in hearing Us and Them (aptly titled), I can see why Godflesh still has reason to exist. Once on, it's really hard to do anything else except be absorbed by the music (yes music), encased within. Yeah, there are break beats, and some other "funky" stuff, but if you need something to listen to to completely clear your mind, check this out. Whew, wiped me out just listening through it once!